This encouraging story shows how life changes when we learn to value those who are differently abled and to champion the power of thoughtfulness. 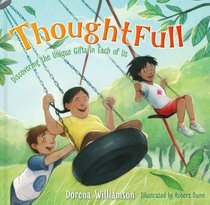 Author Dorena Williamson explores the need to be "thoughtFULL"-full of thoughtfulness and awareness, particularly with those who have special needs. In this delightful story, it's awards day at school, and Ahanu (a boy with Down Syndrome) earns the award for being thoughtful. Later, when his friend Joshua sees others making fun of Ahanu, it's Joshua's turn to be thoughtful by supporting his differently abled friend. While doing so, Joshua learns important lessons about friendship, disabilities, and the value we each have as God's children. Also available in this series: ColorFull: Celebrating the Colors God Gave Us. About "Thoughtfull: Discovering the Unique Gifts in Each of Us"